Piedmont Pines’ undergrounding project is broken into three phases. Combined, our project is PG&E’s largest-ever undergrounding endeavor. Our project falls under California Public Utilities Rule 20A, which is a huge benefit to residents because utilities pay 100% of their construction out of rate payer’s fees allocated to each jurisdiction (City, Counties etc.) for utility undergrounding. Residents inside the boundary for an undergrounding district will be asked to vote if they want to establish an assessment district to fund new street lights and project administration--about 20% of the total project cost. Many homes inside and outside these three phases already have undergrounded utilities. Why? Since 1967, California has required that all new electric service connections be placed underground. December 2013: Construction wrapped up*. New street lights installed. *After a community vote that the pacing of construction should be "go as fast as you can," PG&E, the lead utility, often used four crews at a time, enabling all the trenching and conversion of electrical power to be completed a year ahead of schedule. July 2017: Boundary map, engineering assessment for street lighting system finalized. Community meeting to discuss process, show of interest ballot. Property owners voted 70% approval. 2018: Qualification under Rule 20-A disputed. PPNA is still battling to get this resolved. Next steps: If variance is approved, Assessment District process begins, including balloting property owners. If yes, City Council to vote to establish Assessment District.If no, we move to Phase 3. Phase 2 residents will not get a second chance, so it's important voters are fully informed and mindful. 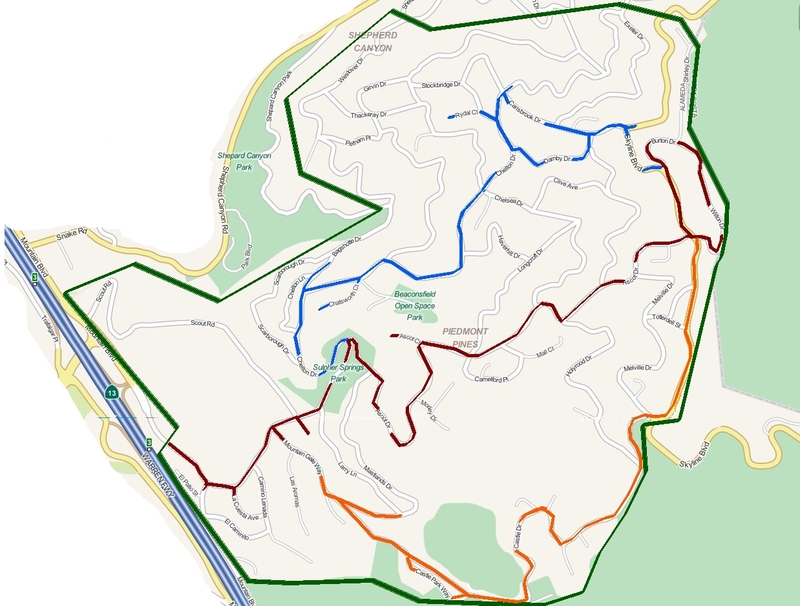 In 1987, Piedmont Pines filed a petition with the City to have all utility lines within its boundaries undergrounded under the California Public Utilities Commission’s Rule 20A, which basically sets out a pot of money from the tax on utility bills to cover undergrounding of the phone, power and cable lines. In 1999, Piedmont Pines rose to the top of the City’s waiting list. Just as we finished tabulating votes among residents to establish an assessment district to fund the homeowner’s portion of the project, everything came to a screeching halt, with a host of complex legal and regulatory issues affecting all Rule 20! undergrounding projects in the state. From 2000 to 2003, the association spent time in front of the CPUC and the state legislature in hearings about what criteria should be considered in forming undergrounding districts. We were joined by the City in our argument that public safety and emergency access should be heavily weighted. We were denied, and a new provision restricting 20A undergrounding to arterial streets meant that over half our streets have been eliminated from the undergrounding project. The legal and regulatory proceedings forced us to step out of line and allow the undergrounding of MacArthur Blvd to proceed. In 2004, we reluctantly accepted a compromise offered by PG&E, the lead utility in this project, that we break the project into three phases because of its complexity (hillsides, narrow streets) and the size of the project. This is the largest Rule 20A project in the state. The risk we wanted to avoid was having another Oakland area get preference between each of our phases. In the meantime, we’ve been assured this will not happen. In 2008, Phase 1 residents voted to go forward with the project and establish an assessment district. While utilities pay 85% of the cost from fees on utility bills across the state, property owners in Oakland are charged the remaining 15% to cover the City’s administration expenses and installation of new street lights that are compatible with an undergrounding system. Property owners have the option of paying the assessment in a lump sum or paying with their property taxes over 30 years starting with the 2010-11 tax year. From 2008 to 2011, the project went through the design phase, with lots of largely unexplained delays along the way. Placement of transformers was one issue, but did not explain the full delay. In 2011, PPNA deployed a finely tuned strategy to force all parties to resolve all remaining roadblocks and get construction under way. We mediated meetings, and at long last, got all issues resolved. In October 2011, PPNA hosted a long awaited groundbreaking celebration for Phase 1. From fall 2011 through winter 2014, construction of the new undergrounding system was completed and nearly all poles were removed in 2015. 2015: we battled against cancellation of Phase 2. Utilities claimed it didn't fit the CPUC Rule 20-A criteria, but PPNA ultimately prevailed and the project got back on course--or so we thought. Read on, to 2018. 2017: the preliminary Engineering Assessment for Phase 2 to determine approximate costs was completed, and results from the show of interest ballots mailed to residents in July was 70% favored proceeding to the next step. March to December: City Council vote to accept Engineering report and to approve balloting procedures to create an assessment district was deferred due to PG&E renewing the dispute whether Chelton Dr meets the criteria, the issue PPNA thought was resolved in 2015. PPNA gathered forces and pushed hard on City and PG&E partners. PG&E will file a variance with the CPUC to include properties they claim don't meet the Rule 20A criteria. PPNA and the City will combine forces to argue before the CPUC that safety, heavy traffic and use of Chelton as an evacuation route qualify the disputed properties. It may take several months before the variance request is considered by the CPUC. If the variance is accepted, the issue then goes to City Council to accept the boundaries and costs for the street lighting system, and authorize a ballot among Phase 2 property owners to establish the Assessment District.